In one hundred years, or even fifty, the Arctic will look dramatically different than it does today. As polar ice retreats and animals and plants migrate northward, the arctic landscape is morphing into something new and very different from what it once was. While these changes may seem remote, they will have a profound impact on a host of global issues, from international politics to animal migrations. In Future Arctic, journalist and explorer Edward Struzik offers a clear-eyed look at the rapidly shifting dynamics in the Arctic region, a harbinger of changes that will reverberate throughout our entire world. Future Arctic reveals the inside story of how politics and climate change are altering the polar world in a way that will have profound effects on economics, culture, and the environment as we know it. Struzik takes readers up mountains and cliffs, and along for the ride on snowmobiles and helicopters, sailboats and icebreakers. His travel companions, from wildlife scientists to military strategists to indigenous peoples, share diverse insights into the science, culture and geopolitical tensions of this captivating place. With their help, Struzik begins piecing together an environmental puzzle: How might the land’s most iconic species—caribou, polar bears, narwhal—survive? Where will migrating birds flock to? How will ocean currents shift? And what fundamental changes will oil and gas exploration have on economies and ecosystems? How will vast unclaimed regions of the Arctic be divided? A unique combination of extensive on-the-ground research, compelling storytelling, and policy analysis, Future Arctic offers a new look at the changes occurring in this remote, mysterious region and their far-reaching effects. "Struzik blends biology and politics with firsthand experience to present a comprehensive...portrait of the future." "Struzik's travel vignettes and discussion about the north are compelling." "Struzik's book is a thoughtful and impassioned argument that we need to respond to a warming world by researching, adapting, and changing what we are able to." "An urgent, passionate defense of ecological conservation and understanding." "An engaging new account of a planet transformed." "In Future Arctic, the intrepid explorer shares tales of his adventures, from surviving a terrifying peregrine falcon attack and tracking polar bears to navigating an anomalous Arctic cyclonic storm and living in native communities...The author views the Arctic through the lenses of archaeology, geology, anthropology, and ecology to draw a unique picture of where the sensitive region has been and where it might be headed." "The scope and detail of his diagnosis lend weight to an alarming prognosis." "A broad, comprehensive, and fair-minded look at not only the upheaval in the Arctic, but what should be done about it." "From a review of the Arctic’s exploration history to an analysis of the many governmental failures there, Struzik makes the case for the Arctic’s unique place in the world and stresses that undeniable change has already occurred, and that coping with change and planning for the future are mandatory...A bracing read." "Provocative…detailed, impeccably reported exploration of how man-made climate change is already reshaping the Arctic…The Arctic’s future isn’t bright, says Struzik, but it is adaptable, if we’re smart. In any case, it is inevitable, and Future Arctic is a must-read for lovers of the far north and climate change realists." "Struzik asks questions of wildlife scientists, military strategists, and indigenous peoples, and paints a complex picture with their stories." These 'Field Notes from a World on the Edge' are just that—the reader has access to a field notebook that has traveled hundreds of miles around the Arctic Circle. Struzik’s field stories help to highlight the changes that are occurring and bring to life the facts and figures he shares. Scientist and lay reader alike will find this an interesting and useful primer for understanding the contemporary physical and metaphorical Arctic landscape." "This book is a fascinating collection of firsthand obervations and insights gleaned from decades of travels with scientists across the Arctic....Though many scientific assessments of Arctic change have been produced, none are as readable or engaging as Future Arctic, and that is what makes this book so important." "Struzik succinctly and vigorously covers almost the full scope of Arctic change....Struzik conveys some sharp observations to which scientists and policymakers ought to pay sincere attention." "Future Arctic is marvelous—as a long-time arctic reseracher, I can honestly say it is the best book that I have seen dealing with the challenges facing the region. A masterful examination of the past, present, and future status of the Arctic, it is also very enjoyable reading, storytelling at its best." "No journalist has traveled more widely in the North American Arctic or understands the region better than Ed Struzik. In Future Arctic he has written a fascinating and vitally important book about the swift changes sweeping across the Far North. If you want to see where the world is headed in an era of rapid warming, this is the book to read." Fen Montaigne, author of "Fraser's Penguins"
"Few places on earth are changing as fast as the high Arctic, and few have told the story as compellingly as Ed Struzik." Bill McKibben, author of "Eaarth"
"Future Arctic is a powerful, provocative, personal look at the Arctic in all its wonder and uncertainty. Ed Struzik has the experience to connect stories that are too often told separately, with vigorous writing and first-hand insight. Be ready to think carefully about what Arctic change means for all of us." Henry P. Huntington, Arctic scientist and co-chair of the USNAS report "The Arctic in the Anthropocene"
"In this engaging and powerful book, Ed Struzik draws on firsthand experience and analysis of policy decisions to provide a detailed account of Arctic ecosystems stressed by shifting weather patterns, pollutants and disease. 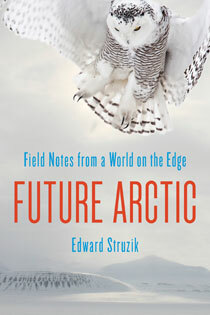 Through Struzik’s compelling insights the reader can begin to draw connections between Arctic environmental change and events occurring elsewhere much further south." Chapter 6: Caribou, Muskox, and Bison: Prey, Tell Us what the Future of the Arctic Will Be? Chapter 9: Oil and Ice, "Drill Baby Drill"
The Arctic is often imagined as a desolate and remote place that is far removed from the rest of the world. But after three decades, Arctic explorer Edward Struzik knows first-hand it is full of life – home to many native peoples and a diverse array of plants and animals whose fate is intimately tied to those who live in the southern hemisphere. Newly available in paperback and with an updated conclusion, Future Arctic: Field Notes from a World on the Edge, explores how climate change will reshape this region and cause tremendous ecological, cultural, and economic shifts across the world. Struzik delves deep into archaeology to answer questions about how the land was changed in the distant past and then delves into present challenges. Being swept up in the terror of a rare Arctic cyclone leads Struzik to investigate how warmer ocean temperatures will fundamentally alter waterways and create fiercer storm surges and storms. Alongside scientists, he counts caribou herds, tracks polar bears, and ventures up cliffs looking for bird nests to survey which species will disappear and which ones will thrive. Through interviews and visits to native communities, he explains what the people who depend on the Arctic are losing and how they might adapt. Future Arctic is a vivid tale of natural history populated with colorful characters, charismatic wildlife and remarkable landscapes. In it, Struzik illuminates the spirit and beauty of the Arctic and makes a compelling case for charting a new course to shape its future. Check out an excerpt from the book below.